The bane pulled up. The town-smoke trailing behind it washed up against its back, rebounding in an acrid fog bank that made the wolves cough. They wheeled around it to fresher air. No longer directly behind the bane, the aspen forest was green again. They kept running, but they still weren’t at the bane’s front. They heard, but did not see its next scream, long, piercing. The sound threw fear into their legs and they slid out into the clearing in time to see Rusty standing her ground before the bane. Behind her, the older hoglet struggled in the bracken. Zeke pulled at the thorns, trying to help him break free, kept glancing up at the monster. Rusty faced the bane, neck of the broken bottle in paw. Her hat flapped in the sour breath of the bird’s cry, and her ears were twisted low against the painful noise. But before Thane could charge, Rusty took the deepest breath Thane’d ever seen anyone take, and screamed back at the bird. It was the beginning to “Blast Taxes,” a song from her new Anger Anthems. A real crowd-pleaser. He’d heard it fill a pub before, but here in the middle of nowhere, it echoed as long and loud as the bane’s screech. The bane flinched, retreating a pace. Thane wasn’t entirely convinced banes had emotions, but he would have sworn this one now looked confused. The bane narrowed its eyes, then screamed at Rusty again, longer, louder. When it had finished, Rusty took a step forward and screamed again, just as wild. Behind her, Zeke pulled the older hoglet free from the gorse. Bright quills disappeared into the shadowy underbrush, and then a possum tail followed. The bird looked either away, as though seeking guidance. If it hadn’t been the size of two barns stacked atop one another, Thane would have laughed. It looked so absurd stopped dead in its tracks in front of Rusty, who looked as tiny as a newborn quail next to its mother. The feathers on the bird’s neck rippled. But instead of roaring again, it reared back, flapping its wings. Thane recognized the move from the banes he’d fought before. He raced out to get between the bane and the vixen. The bane fell towards them. Rusty jumped into the bracken. Thane raised his sword. Oh. It’s a lot bigger from down here. The bane, spotting the grey wolf, opened its beak. At the last second, Thane dodged, striking his sword against the bane’s cheek. The bird’s own momentum completed the slice without Thane having to move. Thane’s claws dug into the dying turf as he fought to keep his sword pressed against the creature without getting swept up by it. He locked his eyes on the bird’s wing, heading for him fast. Thane rolled away from the bane’s body, a trick that normally sent him safely out of harm’s way. But he hadn’t counted on the gargantuan wingspan of the monster. He was about to stand up right in the middle of the wing. He realized his mistake at the last second, and tried to stay low at the end of his roll. But the wing caught him anyway, traveling faster than a falling star. The blow sent him tumbling tail over nosetip. The wolf lay sprawled on the grass, and made no move to get up. Simon bobbed in place until the wing completely passed, then raced over. “Don’t move, don’t move.” Simon swung his equipment sack off and piled through it until he found the bag of Wyld weed. Not as good as the rat’s Wyldsap. Simon poured the flakes into Thane’s mouth. Not the ideal way to consume it—but better than nothing. “Bluech!” Thane smacked his mouth to get rid of the taste. But in just a few minutes, he pushed himself up on his own. He breathed for a few moments, facing the blackened road the bane had decayed over the gorse. Chapter 16 comes tomorrow at noon, PST! The game Armello and its characters are property League of Geeks. Buy it today! 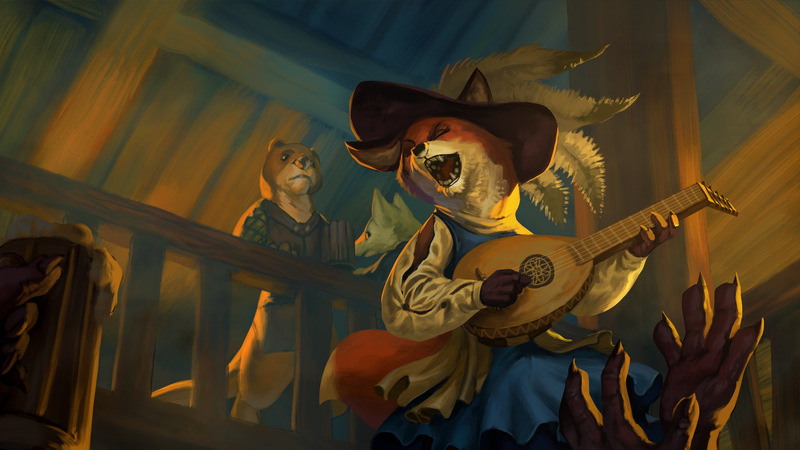 You might also like to see this full-sized version of the Bard card, because it is a beautiful painting by Jerome Jacinto.